Although it is played on a stunning golf course and features 18 of the best players in the world, the Hero World Challenge tends to be somewhat of a banal viewing experience every year. 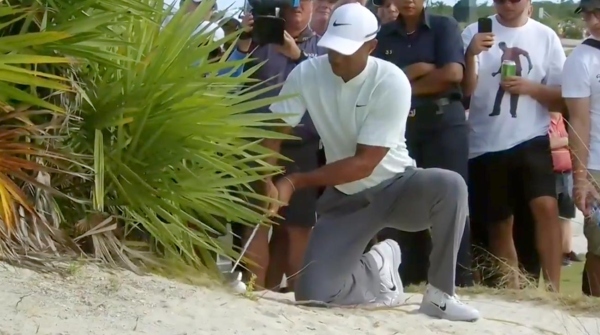 This year, however, golf fans that watched the second round of the event were treated to a bizarre rules controversy involving tournament host Tiger Woods and a thick palm bush on the 18th hole. After missing the fairway wide right into said bush with his tee shot, Woods chocked up on a short iron, got down on his knees and hacked his ball back toward the fairway. It will be a major letdown if Ho-Sung Choi does not receive at least a few sponsorship exemptions onto the PGA Tour this season. The South Korean, whose unconventional golf swing garnered the attention of the golf world in June when he nearly qualified for The Open, picked up his third win as a professional two weeks ago in Japan. Choi edged Aussie Brendan Jones by a single stroke at the Casio World Open, displaying the same unbalanced “fisherman’s swing” throughout the event that had earned him internet celebrity status over the summer. Here’s Choi, tied with Jones at -14 on the 72nd hole of the tournament, reaching for a little extra on his tee shot before nearly falling flat on his face in his follow through. You would never expect it from that finish, but Choi actually split the fairway with that drive. It set up a 3-wood swipe so mighty that his knee somehow touched the ground after he impacted the ball. At 45 years old, the journeyman is obviously no spring chicken. But, all of a sudden, Choi has finished T-18 or better in four of his last six starts and has vaulted to a career-best 209th in the world golf rankings. If anyone deserves a sponsorship exemption in golf at the moment, it’s this guy. Not only is he currently playing some of the best golf of his life, North American fans legitimately cannot get enough of him. And for good reason … the guy is a blast to watch! We would gladly trade any future Tiger vs. Phil matches for some more Ho-Sung Choi in our lives. Let’s make it happen! John Senden completely whiffed on his tee shot at the Volkswagen Scramble over the weekend when his driver shaft snapped in two underneath the grip. That’s a lot of torque! The Aussie might want to consider reducing the number of bicep curls he does each week going forward to prevent a similar incident in the future. Very impressive, but we don’t suggest trying this on the driving range at your home course. Who put that tree there?! Hit the ball straighter and more consistently with this tip from The Golf Lab.